Editors Note: We get a lot of requests from readers to talk about the Polymer80 polymer lowers, so we recently had Jeremy Bedsaul of TacFix take a look at one for us. Aluminum has always been the no-brainer choice for builds…and nothing here has changed that perspective, but it was interesting to see Jeremy go hands-on with one. Today we are going to be finishing an AR-15 lower receiver from the G150 kit from Polymer80. Some of the interesting things about this kit are that all of the tool and the required jig are included, and the polymer is a lot easier to mill out for a first time 80% build. This means that there is no jig to buy separate from this kit, which somewhat simplifies the build process. With these features, the Polymer80 kits are an interesting option for the new, at-home gunsmith and I’ve seen it argued that they are a good first step before attempting an aluminum build. I’d love to hear your opinions on this in the comments below. 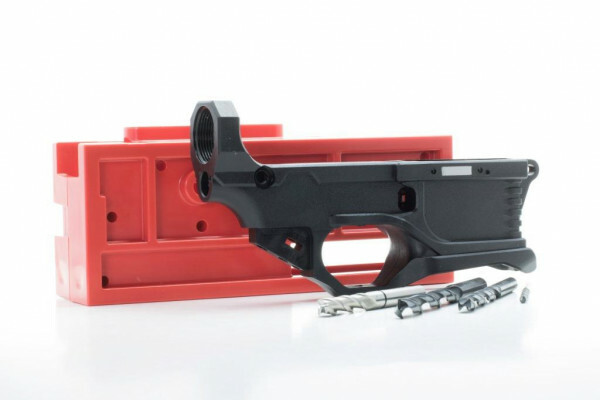 If you’re going to build a lower you want it to be strong, but just how does this polymer lower stack up compared to a standard aluminum receiver? Your typical ABS/Polypropylene plastic clocks in at about 40 MPa (megapascal, unit of pressure). To give you an idea how that translates, 1 MPa is roughly equal to 145 Psi. A Nylon6 polymer similar to what you might find in a Glock frame or a part like this lower (though each company has their own specific blend) will typically be around 70 MPa, while 6061-T6 aluminum will be closer to 240 MPa. The aluminum will obviously be the stronger part…The thing you want to ask yourself is what is the intended you of this firearm? Is it going to be a duty rifle or see heavy competitive use? If so, then the aluminum part is going to be the way to go. Now…if this is intended to be a fun project to build your skills, or if you plan this rifle to be for light range use, then polymer MAY be an option for you. Use a cross slide vise (sometimes called an XY vise). Make sure to bolt it down. With many vises there will be a bit of play that can affect the accuracy of the part. Having the vise securely bolted down will keep this to a minimum. Lube the threads and friction bearing surfaces. The action of the cross slide vise depends on there being as little friction as possible. Do not use the drill press for the pivot/takedown pin and safety selector holes. Doing this can cause the holes to not properly center and line up. If your drill press has the option for a locking quill that is a highly advisable option to purchase. Jeremy Bedsaul is an avid writer, video editor, & shooter. His oldest shooting memories go back to shooting 22s with his father and grandfather out in rural central Missouri. Jeremy is a husband and father of two girls who can’t wait until they are old enough for him to share his passion for firearms with. Outside of firearms, Jeremy’s interests include RPG gaming, philosophy, arguing about politics, and keeping up with the latest tech and gadgets. Jeremy runs the blog over at TacFix.com where he posts reviews, build videos, tips & tricks related to many pistol and rifle platforms.